Need Flap discs, cut off wheels or flap discs? We have the abrasive wheel you need. With every grit under the sun Dewalt, Pferd and Wylaco have your grinder wheels covered! Features: Extended Performance flap design lasts 2.5x's longer than std flap discs Premium zirconia cloth prodives agressive grinding action 40% faster than std flap discs Proprietary design provides removal rate of a grinding wheel with finish of a fiber resin disc Diameter: 4-1/2 " Arbor Size: 7/8" Grit: 40 ..
DeWalt DW8424H Metal Cutting Wheel 4-1/2"
This is offer is only good while supplies last, then it is gone for good! Get 10 wheels for just $15 Thin .045" wheel design for fast burr free cutting Proprietary aluminum oxide grain combination for aggressive cutting action Proprietary material mix ensures durable long life wheels 2 full sheets of fiberglass for durability and safety DW8424H 4-1/2" x .045" x 5/8"-11 Metal.. Features: Thin .045" wheel design for fast burr free cutting Proprietary aluminum oxide grain combination for aggressive cutting action Proprietary Material Mix ensures durable long life wheels 2 full sheets of fiberglass for durability and safety Diameter: 4-1/2" Edge Thickness: .045" Arbor Size: 7/8" Grit: A60T Max RPM: 13,300 .. Features: Extended Performance flap design lasts 2.5x's longer than std flap discs Premium zirconia cloth prodives agressive grinding action 40% faster than std flap discs Proprietary design provides removal rate of a grinding wheel with finish of a fiber resin disc Diameter: 4-1/2 " Arbor Size: 7/8" Grit: 60 .. Features: Extended Performance flap design lasts 2.5x's longer than std flap discs Premium zirconia cloth prodives agressive grinding action 40% faster than std flap discs Proprietary design provides removal rate of a grinding wheel with finish of a fiber resin disc Diameter: 4-1/2 " Arbor Size: 7/8" Grit: 80 .. Features: Extended Performance flap design lasts 2.5x's longer than std flap discs Premium zirconia cloth prodives agressive grinding action 40% faster than std flap discs Proprietary design provides removal rate of a grinding wheel with finish of a fiber resin disc Diameter: 4-1/2 " Arbor Size: 5/8-11 " Grit: 120 Max rpm: 13,300 .. This is a limited time special while supplies last! Features: Extended Performance flap design lasts 2.5x's longer than std flap discs Premium zirconia cloth prodives agressive grinding action 40% faster than std flap discs Proprietary design provides removal rate of a grinding wheel with finish of a fiber resin disc Diameter: 4-1/2 " Arbor Size: 5/8-11 " Grit: 80 Max rpm: 13,300 .. Features: 3 full sheets of fiberglass for durability and safety. Use of 100% virgin grain for enhanced removal and long life. Proprietary material mix to ensure premium performance. Premium resin bonds 100% inspected before use. .. 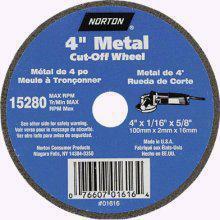 Features: 4-1/2" x .045" x 7/8" Metal Cutting Wheel Thin .045" wheel design for fast burr free cutting Proprietary aluminum oxide grain combination for agressive cutting action Proprietary Material Mix ensures durable long life wheels 2 full sheets of fiberglass for durability and safety. Diameter: 4-1/2 Edge Thickness: 045 Arbor Size: 7/8 .. Features: High performance aluminum oxide grain for long life and high material removal High grain concentration for agressive grinding action and smoother running wheels Proprietary material mix ensures durable long life wheels 3 full sheets of fiberglass for durability and safety .. Features: 3 full sheets of fiberglass for durability and safety Use of 100% virgin grain for enhanced removal and long life Proprietary material mix to ensure premium performance Premium resin bonds 100% inspected before use .. Features: Portable Grinding Wheel Diameter 4 1/2 In, Thickness 3/32 In Arbor Hole 5/8-11 In Max RPM 13, 300 Aluminum Oxide Abrasive Designed For General Purpose Cutting and Notching Type 27 .. Features: 7 x 1/4 x 5/8-11 Depressed Center Wheel Premium resin bonds 100% inspected before use 3 full sheets of fiberglass for durabilitity and safety Use of 100% virgin grain for enhanced removal and long life Proprietary material mix to ensure premium performance. .. These grinding wheels give you an excellent, economical way to grind a variety of hard materials such as concrete, stone and masonry. Use single row grinding wheels for rough work and rapid stock removal. Use double row grinding wheels for finer finishing. 7” x 5/8”-11 thread ..
CR C35 Beveled V-Crack Chaser Tuck Pointing Blades Cleans, routs and repairs cracks Fast cutting Use for dry or wet 4 x .375” x 5/8-11 ..
PFERD Grinding & Cut-off Wheels offer world-leading performance. For free-hand, portable, chop and stationary saws. Silicon Carbide grain Fast cutting rate, long service life 5/8-11 thread .. Description: PFERD POLIFAN Flap Discs combine the 2-step process of rough grinding with a hard wheel and finishing with a fiber disc. One-step POLIFAN Flap discs are aggressive, and capable of extremely high removal rates. They grind quietly and comfortably for enhanced user comfort. They leave a superior surface finish, and can save you time and money. The universal PSF line is the economical ch.. Features: Very fast cutting rate, good service life Tool Shape : Type 1 Dia. : 6 in Thickness : 0.0400 in Arbor Diam : 7/8 in Abrasive Material : Aluminum Oxide Grit : 60 Hardness Grade : P Speed : 10200 rpm [Max] Abrasive Trade Name : A Applicable Materials : Carbon Steel, Ferrous Metals Mounting : Arbor Hole Used With : Right Angle Grinders .. Features: PFERD Grinding & Cut-off Wheels offer world-leading performance. For free-hand, portable, chop and stationary saws. High performance grinding wheel provides long service life for reduced wheel changes. Particularly well suited for use in severe, high pressure grinding applications (e.g. edge grinding, beveling, etc). Fast removal rates on carbon steel and all ferrous metals. Alu.. Features: MAXIMUM RPM 12200 SUGGESTED USE Steel, Cast Iron, Non-Ferrous Metals WEIGHT LBS 0.59 GRIT 46 DIAMETER INCHES 5 ARBOR SIZE 7/8 in TOOL SHAPE Type 27 .. Features: High removal rate Long service life Low noise No vibration Non loading Broad grit range Quick change hub available Product Specifications BRAND Pferd MAXIMUM RPM 12200 WEIGHT LBS .52 GRIT 40 ARBOR THREAD 5/8 in - 11 DIAMETER INCHES 4-1/2 TOOL SHAPE Type 27, Flat .. Features: High removal rate Long service life Low noise No vibration Non loading Broad grit range Quick change hub available Product Specifications BRAND Pferd MANUFACTURERS PART NUMBER 62252 MAXIMUM RPM 13300 WEIGHT LBS 0.33 GRIT 60 ARBOR THREAD 5/8 in - 11 DIAMETER INCHES 4-1/2 TOOL SHAPE Type 27, Flat .. Features: Weld removal, surface and edge grinding. Tool Shape Type 27 Dia. 7 in Thickness 1/4 in Arbor Thread - TPI or Pitch 5/8 in - 11 Abrasive Material Aluminum Oxide Grit 30 Hardness Grade N Speed 8600 rpm [Max] Applicable Materials Steel, Non-Ferrous Metals MountingThreaded Hole Type Depressed Center Wheel .. Features: Tool Shape : Type 27 Dia. : 5 in Thickness : 1/4 in Arbor Diam : 7/8 in Abrasive Material : Silicon Carbide Grit : 24 Hardness Grade : Q Speed : 12200 rpm [Max] Abrasive Trade Name : C .. Features: Tool Shape : Type 27 Dia. : 4 1/2 in Thickness : 1/8 in Arbor Diam : 7/8 in Abrasive Material : Aluminum Oxide Grit : 24 Hardness Grade : R Speed : 13300 rpm [Max] Abrasive Trade Name : A .. BENCH GRINDING WHEELAluminum oxide materialFor metal grinding applicationsCenter hole 1"Bushings included to fit other arbor-sizes: 1/2 5/8 3/4 & 7/8"SIZE:8 x 1 x 1"GRIT:Medium.. TYPE 27 MASONRY GRINDING WHEELMade with silicone carbideFiberglass reinforcements for maximum strengthDesigned not to load up.. TYPE 27 METAL GRINDING WHEELMetal depressed center grinding wheelMade with resin bondTwo-ply fiberglass reinforced wheelBalanced design for long life & efficiency.. TYPE 27 METAL GRINDING WHEEL WITH HUBDepressed center wheel with 5/8" - 11 hubMade with resin bondTwo-ply fiberglass reinforced wheelBalanced design for long life & efficiency..
REINFORCED CUT OFF WHEELSResin bonded and reinforced with fiberglassAssures the highest quality & safetyFor high performance cutting & groovingSIZE= diameter x thickness x arbor hole ..
MANDREL FOR SMALL CUTTING WHEELFits both 1/4" & 3/8" arbor grinding wheelsHas 1/4" shankCarded for easy retail sale..
METAL DOUBLE REINFORCED CUT OFF WHEELUse with high speed, gas powered sawsK-T reinforced cut off wheels are resin -bonded & reinforced with fiberglassAssures highest quality and safetyDouble strength fiberglass for maximum strengthUse for cutting metal shapes and solids5/32" thickness with 1" arbor hole..
METAL CUT OFF WHEELResin bonded & fiberglass reinforcedAssures the highest quality and safety7/64" wheels work on low horse power sawsUse on stationary cut off saws only..
METAL CUT-OFF WHEELDouble fiberglass reinforced wheelFor fast cutting in metalGeneral purpose wheel for use with chop saws -and stationary saws only3/32" thickness - 1" arbor holeType 1 - maximum RPM 4,000..
METAL CUT OFF WHEELResin bonded & fiberglass reinforcedAssures the highest quality and safetyDesigned to be used on hand saws5/8" round arbor hole with diamond knockout8,700 Max RPM.. CONTINUOUS RIM DIAMOND BLADEDiamond blade is used for cutting tile, -masonry, stone, granite and marbleFast, smooth and chip free cuttingCan be used for wet or dry cuttingFeatures advanced high density bond, high -center strength & high diamond concentration7/8" arbor with 20mm & 5/8" bushings..
SEGMENTED RIM DIAMOND BLADEDiamond blade is used for cutting masonry -products, granite, marble, concrete & brickFast cutting and very efficientCan be used for wet or dry cuttingFeatures advanced high density bond, high -strength & high diamond concentration4-1/2" diameter x .080" thickness7/8" arbor with 20mm & 5/8" bushings.. TYPE 29 BLUE ZIRCONIA FLAP DISCSUse where you would use a resin fibre disc-or grinding wheelIndividual flap edges wear down gradually -to give it an extremely long lifeFlap discs are more economical than resin -fibre disc because of the long use life4-1/2" diameter with 7/8" arbor holeMaximum RPM 13,000.. TYPE 29 BLUE ZIRCONIA FLAP DISC W/HUBUse where you would use a resin fibre disc-or grinding wheelIndividual flap edges wear down gradually -to give it an extremely long lifeFlap discs are more economical than resin -fibre disc because of the long use life4-1/2" diameter with 5/8-11 arborMaximum RPM 13,000..
EMERY CLOTH SHOP ROLLSUse to polish shafts or other round itemsFor items difficult to sand with sandpaper..
REINFORECED CUT-OFF BLADEFor use on all popular electric and air die -grinders for fast cut-off and slottingUse on all types of metalMaximum rpm: 19,100Size= blade diameter x thickness3/8" round arborSIZE:4"x .035"PACK TYPE:Bulk Pack.. DEPRESSED CENTER MASONRY GRINDING WHEELSType 27 silicon carbide grit grinding wheelsFor concrete & masonry cutting and grindingSize= wheel diameter x thickness x arbor sizeSIZE:4-1/2x 1/4x 7/8"MAX-RPM:13,580..
ALUMINUM OXIDE FIBER DISCFor paint stripping, light deburring & finishingUse also for weld grinding, and blending,plus heavy metal removalMetalite(R) F226 bulk discs7" diameter with 7/8" holePacked bulkSIZE:7"GRIT:36..
ALUMINUM OXIDE FIBER DISCFor paint stripping, light deburring & finishingUse also for weld grinding, and blending,plus heavy metal removalMetalite(R) F226 bulk discs7" diameter with 7/8" holePacked bulkSIZE:7"GRIT:80..
REINFORECED CUT-OFF BLADEFor use on all popular electric and air die -grinders for fast cut-off and slottingUse on all types of metalMaximum rpm: 19,100Size= blade diameter x thickness3/8" round arborSIZE:3" x 1/16"PACK TYPE:Carded.. DEPRESSED CENTER METAL GRINDING WHEELA27 aluminum oxide grinding wheels1/4" thickness wheels designed for offhand -stock removal of all types, smoothing welds -and pipe beveling1/8" thickness wheels are to be used at 90 -degree angle for offhand cut-off of all -metal & masonry material & notching or -cleaning pipes and weld beadsSIZE:4x 1/4x 5/8"MAX-RPM:15,280.. DEPRESSED CENTER METAL GRINDING WHEELA27 aluminum oxide grinding wheels1/4" thickness wheels designed for offhand -stock removal of all types, smoothing welds -and pipe beveling1/8" thickness wheels are to be used at 90 -degree angle for offhand cut-off of all -metal & masonry material & notching or -cleaning pipes and weld beadsSIZE:4-1/2x1/8x7/8"MAX-RPM:13,580.. DEPRESSED CENTER METAL GRINDING WHEELA27 aluminum oxide grinding wheels1/4" thickness wheels designed for offhand -stock removal of all types, smoothing welds -and pipe beveling1/8" thickness wheels are to be used at 90 -degree angle for offhand cut-off of all -metal & masonry material & notching or -cleaning pipes and weld beadsSIZE:4-1/2x1/4x7/8"MAX-RPM:13,580.. DEPRESSED CENTER MASONRY GRINDING WHEELSType 27 silicon carbide grit grinding wheelsFor concrete & masonry cutting and grindingSize= wheel diameter x thickness x arbor sizeSIZE:4x 1/4x 5/8"MAX-RPM:15,280.. DEPRESSED CENTER METAL GRINDING WHEELA27 aluminum oxide grinding wheels1/4" thickness wheels designed for offhand -stock removal of all types, smoothing welds -and pipe beveling1/8" thickness wheels are to be used at 90 -degree angle for offhand cut-off of all -metal & masonry material & notching or -cleaning pipes and weld beadsSIZE:4x 1/8x 5/8"MAX-RPM:15,280.. BENCH GRINDING WHEELAluminum oxide materialFor metal grinding applicationsCenter hole 1"Bushings included to fit other arbor-sizes: 1/2 5/8 3/4 & 7/8"SIZE:6 x 3/4 x 1"GRIT:Medium.. BENCH GRINDING WHEELAluminum oxide materialFor metal grinding applicationsCenter hole 1"Bushings included to fit other arbor-sizes: 1/2 5/8 3/4 & 7/8"SIZE:6 x 1 x 1"GRIT:Fine.. RIGHT ANGLE CUT OFF BLADESType 1 unique thin design cut-off blades for -cleaning, slotting & cutting metal & masonryUse for cutting metal studs, angle iron, -tubing, autobody panels and sheet metalAluminum oxide grit for metal cuttingSilicon carbide grit for masonry cuttingSize= diameter x thickness x arbor hole sizeSIZE:4-1/2x1/16x7/8DESC:Masonry Cutting.. DEPRESSED CENTER MASONRY GRINDING WHEELSType 27 silicon carbide grit grinding wheelsFor concrete & masonry cutting and grindingSize= wheel diameter x thickness x arbor sizeSIZE:7x1/4x 5/8-11MAX-RPM:8,600.. RIGHT ANGLE METAL CUT-OFF BLADEType 27 cut-off blade for metal cutting -applicationsUnique thin designFor sheet metal, metal studs, angle iron -and tubingSize= blade diameter x thicknessArbor size 5/8 x11SIZE:4-1/2" x .045ARBOR:5/8 - 11.. RIGHT ANGLE CUT OFF BLADESType 1 unique thin design cut-off blades for -cleaning, slotting & cutting metal & masonryUse for cutting metal studs, angle iron, -tubing, autobody panels and sheet metalAluminum oxide grit for metal cuttingSilicon carbide grit for masonry cuttingSize= diameter x thickness x arbor hole sizeSIZE:4x 1/16x 7/8DESC:Masonry Cutting.. BENCH GRINDING WHEELAluminum oxide materialFor metal grinding applicationsCenter hole 1"Bushings included to fit other arbor-sizes: 1/2 5/8 3/4 & 7/8"SIZE:6 x 1 x 1"GRIT:Coarse.. DEPRESSED CENTER METAL GRINDING WHEELA27 aluminum oxide grinding wheels1/4" thickness wheels designed for offhand -stock removal of all types, smoothing welds -and pipe beveling1/8" thickness wheels are to be used at 90 -degree angle for offhand cut-off of all -metal & masonry material & notching or -cleaning pipes and weld beadsSIZE:7x 1/4x 5/8-11MAX-RPM:8,600.. DEPRESSED CENTER MASONRY GRINDING WHEELSType 27 silicon carbide grit grinding wheelsFor concrete & masonry cutting and grindingSize= wheel diameter x thickness x arbor sizeSIZE:4x 1/8x 5/8"MAX-RPM:15,280.. RIGHT ANGLE CUT OFF BLADESType 1 unique thin design cut-off blades for -cleaning, slotting & cutting metal & masonryUse for cutting metal studs, angle iron, -tubing, autobody panels and sheet metalAluminum oxide grit for metal cuttingSilicon carbide grit for masonry cuttingSize= diameter x thickness x arbor hole sizeSIZE:4-1/2x.040x7/8DESC:Metal Cutting..
DRILLSAND(R) MANDREL FOR CUT-OFF BLADEHex shank mandrel with quick lock -Configuration fits standard drillsSecures 3" small diameter cut-off blades.. RIGHT ANGLE CUT OFF BLADESType 1 unique thin design cut-off blades for -cleaning, slotting & cutting metal & masonryUse for cutting metal studs, angle iron, -tubing, autobody panels and sheet metalAluminum oxide grit for metal cuttingSilicon carbide grit for masonry cuttingSize= diameter x thickness x arbor hole sizeSIZE:4"x.040x5/8"DESC:Metal Cutting..
CIRCULAR SAW METAL CUT-OFF BLADEStandard grade aluminum oxide grit delivers -good performance & life cutting metal1/8" thickness cut-off blades5/8" round arbor with diamond knockoutSIZE:6-1/2"DESC:9405 Max. RPM..
CIRCULAR SAW MASONRY CUT-OFF BLADEStandard silicone carbide grit delivers good -performance cutting brick, block, concrete -or other masonry materials1/8" thickness cut-off blades5/8" round arbor with diamond knockoutSIZE:6-1/2"DESC:9405 Max. RPM.. BENCH GRINDING WHEELAluminum oxide materialFor metal grinding applicationsCenter hole 1"Bushings included to fit other arbor-sizes: 1/2 5/8 3/4 & 7/8"SIZE:6 x 3/4 x 1"GRIT:Coarse.. BENCH GRINDING WHEELAluminum oxide materialFor metal grinding applicationsCenter hole 1"Bushings included to fit other arbor-sizes: 1/2 5/8 3/4 & 7/8"SIZE:6 x 1 x 1"GRIT:Medium..
CIRCULAR SAW METAL CUT-OFF BLADEStandard grade aluminum oxide grit delivers -good performance & life cutting metal1/8" thickness cut-off blades5/8" round arbor with diamond knockoutSIZE:7" DiameterDESC:8730 Max. RPM.. DEPRESSED CENTER MASONRY GRINDING WHEELSType 27 silicon carbide grit grinding wheelsFor concrete & masonry cutting and grindingSize= wheel diameter x thickness x arbor sizeSIZE:4-1/2x 1/8x 7/8"MAX-RPM:13,580..